The 3rd of August saw the final day of the Prescott VSCC hillclimb near Cheltenham, Gloucester. I want along to photograph the timed runs on the final day of the meeting, having been at the Peak Rail 1940s event the day before. I took with me the Canon 5D MkIII, with the 24-105mm lens, as well as the 70-200mm lens. I also had my faithful Mamiya C330F with me, with which I used FP4+ to photograph action on a very sunny day. During practice in the morning there was a rather scary moment at Winston Teague in the distinctive GN Wasp got very sideways on the way into the hairpin at Prescott. Winston Teague gets it very wrong entering the hairpin at Prescott, but somehow managed to avoid contact with the barrier or a roll over. I managed to capture a series of 5 shots as the Wasp flew past rather dramatically, all of which can be seen in my VSCC Prescott album on Flickr. As drivers pushed hard to set the fastest times, there were plenty of sideways moments. Few racers are more dramatic than Richard Scaldwell in the GN Jap, as he got the back end out through the first hairpin. Richard Scaldwell getting the GN Jap very sideways as he pushed hard to set a fast time at Prescott. I liked the movement in the wheels captured in this photograph, while the rest of the car appears still and sharp. This goes to prove how fast these cars can get, despite their age. 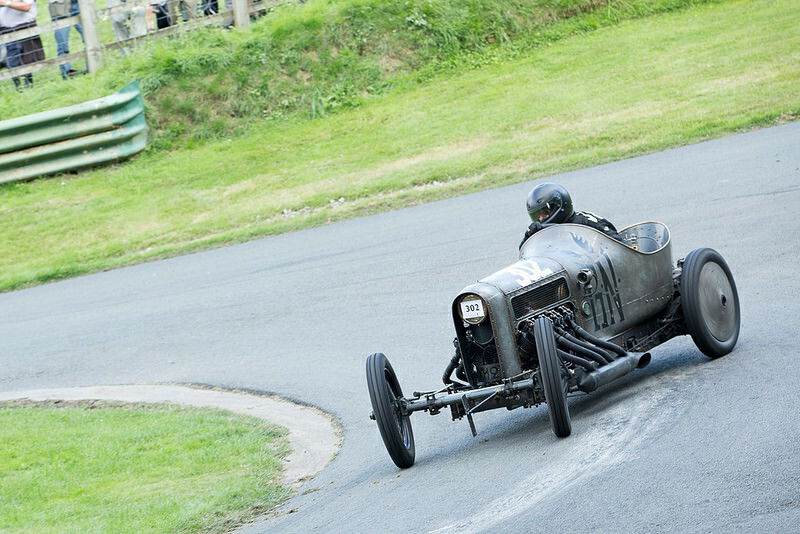 Getting the power down out of the hairpin was just as hard, as William May proved in the little Austin 7. 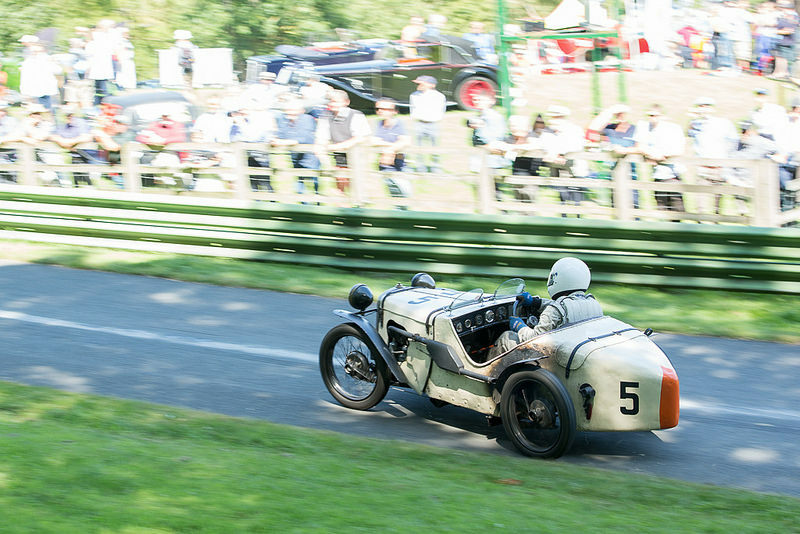 Willaim May’s Austin 7 getting sideways under the trees. I needed to compensate for the shadows to get enough detail into the cars in this very contrasty environment. Photographing under the trees on such a bright day meant that I had to correct the exposure for 1 1/3 stops, so that I would get enough detail out of the shadows to not produce flat tones. Here the car looks properly exposed while the bright sunlight creates a very white background as the crowd looks on. 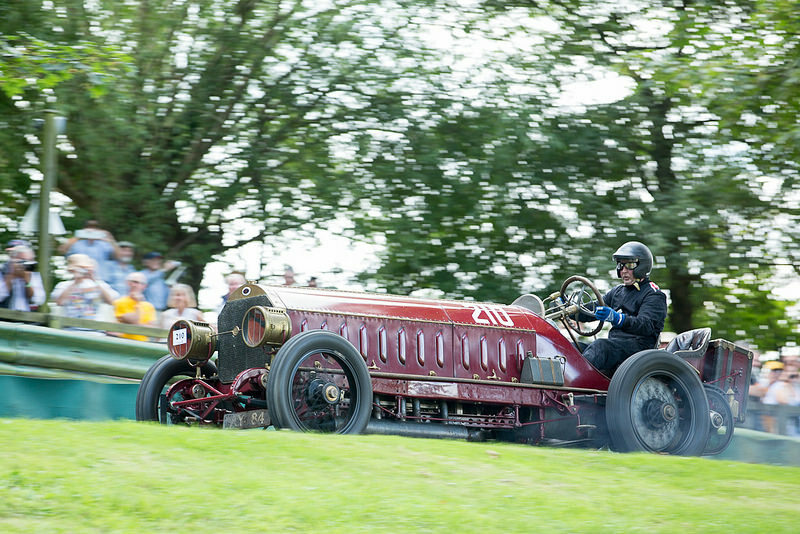 The huge Fiat/Isotta Fraschini 200HP of Michael Vardy was one of the highlights of the weekend. This huge car not only sounded fantastic, but looked incredible as it made it’s way up the twisty Prescott course. The car seemed surprisingly agile despite it’s size, although I do think that the high and far back seating position made this very difficult to achieve. The massive Fiat/Isotta Fraschini 200HP racing at speed at Prescott. A sense of speed was a must for photographing this huge car. This has always been a large part of my photography, regardless of what subject I am photographing. The GN/Ford Piglet machine raced by Liz Cawley passing under the Longstone Tyres sign was a shot too good to miss. 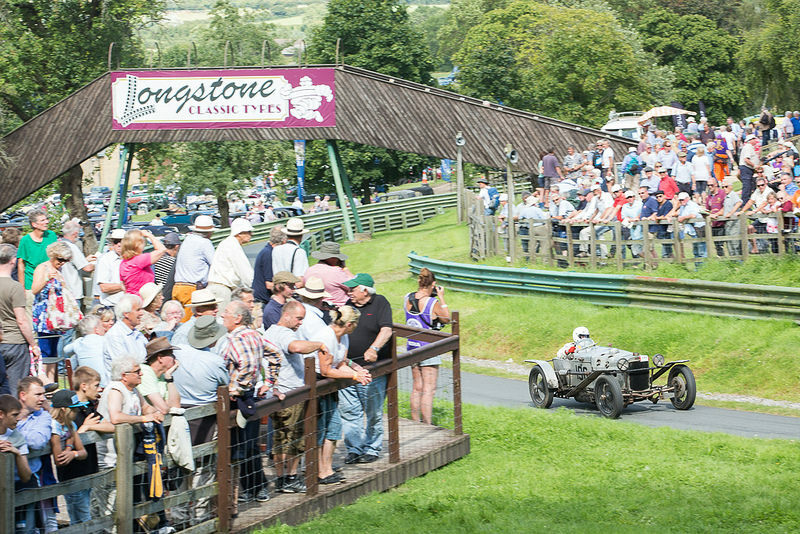 Liz Cawley races under the Longstone Tyres family business banner at Prescott. This photograph gave a sense of the scale of the event at Prescott, with many fans turning out to see the vintage cars setting their times on the hill. With so many competitors the day was very busy, so I was only able to run a single roll of film through the Mamiya. I did manage to photograph both action and still life, but not as much as I may have liked. The side of the Gnat, complete with the wheel, engine and exhausts as the car sat in the paddock. 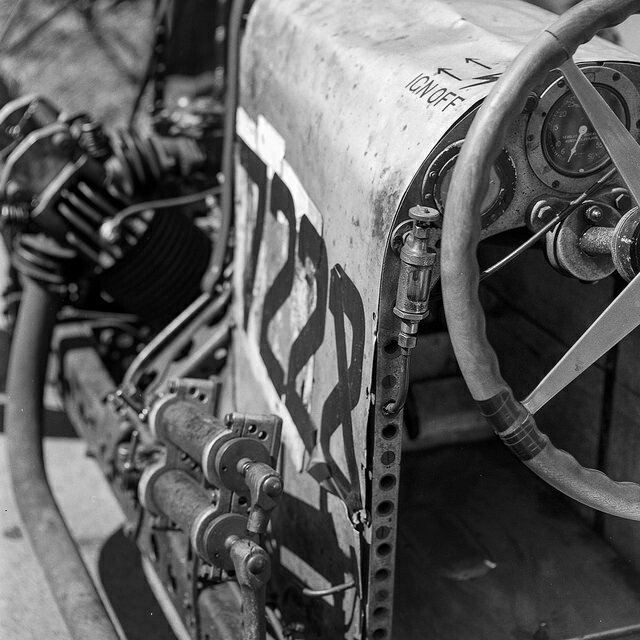 I loved the detail and tones created on this image with the FP4 film. The tones in this image gave a great sense of depth, as did the depth of field focusing on the ‘IGN Off’ controls and the dashboard. On the hill, photographing under the trees on the Mamiya also produced great results. 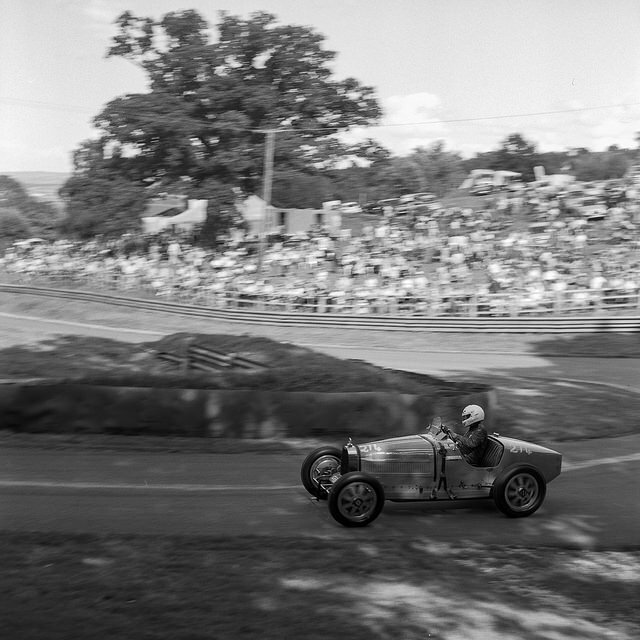 Mike Marshall in the Bugatti races under the trees at Prescott. The film managed to capture both the highlights and shadows in a single shot. I was really surprised at how much detail the film managed to capture despite the large contrast in light levels between the light parts of the image and the shaded section under the trees. The slight sense of movement adds a sense of speed to the photograph as the Bugatti races up the hill. I really enjoyed my time at the Prescott hillclimb. It was the first time that I had been to the event, and there was a huge amount to see. I would have liked to have spent more time at the event, and I may consider staying longer next year if I decide to go back. I would want to explore the other photography locations around the hill, as I only really saw the bottom half of the course. 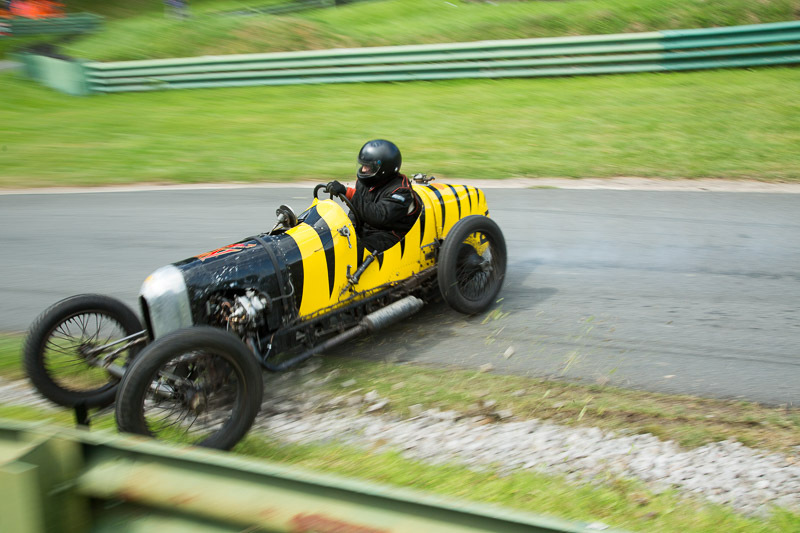 A set of selected images can be seen in my VSCC Prescott Speed Hillclimb album on Flickr.